In 2013 we prepared a Parkland Management Plan, funded through Higher Level Stewardship (HLS), for this exceptional grade II* registered landscape. Famous for its iconic layout by Lancelot ‘Capability’ Brown, the park is no less interesting for its earlier formal layout by George London and Moses Cook, which Brown incorporated into his design and survives to this day through the impressive lime avenues that traverse the landscape. 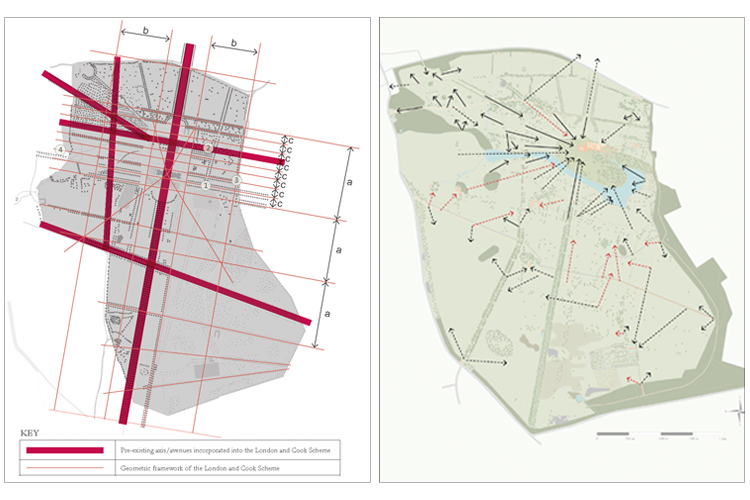 We combined extensive archival research, field survey and graphical mapping analysis to fully understand the historic development of the park and the key significances of the design. With our specialists we further sought to understand all aspects of the landscape, including archaeology, land use, visitor perceptions and ecology, before drawing together all of the park’s significances and issues in order to devise holistic, practical and targeted management proposals that will serve to restore the parkland as a cohesive entity whilst conserving it as a viable working estate. We have since been commissioned by the Burghley Estate to oversee the restoration of the park’s 18th century walled garden, one of the largest in the country.